It has been reported that the Nigerian special forces and the Air force are beginning to deal with the Boko Haram terrorist group, whose head quarters is in Sambisa Forest of Borno State. Eventhough the soldiers killed thousands of the Boko Haram insurgents according to reports, about 20 soldiers were reported missing after the attack. No fewer than an estimated 2,000 insurgents were killed in a combined operation by Special Forces and the men of the Air Force on Friday and Saturday in the volatile Sambisa Forest of Borno State, which has become a prominent hideout of the violent Islamic sect, Boko Haram. What would have been a great victory for the Special Forces was, however, marred by an operational misunderstanding between the ground troops and the officers in the Air Force Alpha Jet. 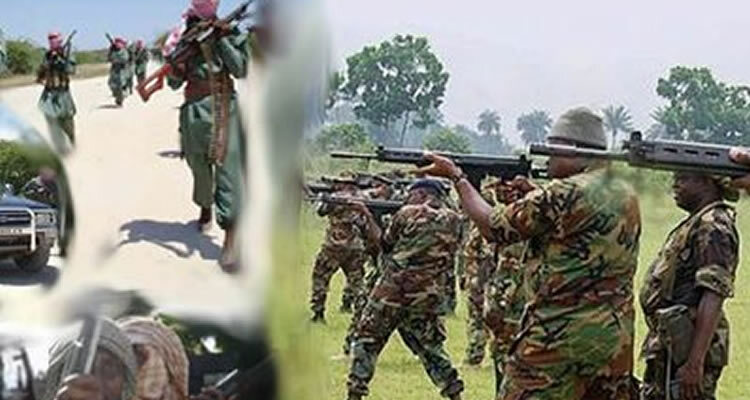 Investigations revealed that 20 soldiers are still missing as a result of the operational misunderstanding. It was learnt that mid-way into the operation, the Air Force Alpha Jet radioed the ground forces who had advanced in three companies, that they should withdraw because it was running out of bombs. It was learnt that while the second and the third battalions withdrew, the first company of soldiers did not get the critical operational order. The situation was said to have put them at a numerical disadvantage in the encounter with the insurgents. It was gathered that the soldiers fought their way through in desperation until they got to Bama Barracks. Investigation revealed that a headcount among the soldiers revealed that 20 of them were missing. The military would not declare a soldier dead unless the corpse is recovered. It was further learnt that the soldiers became bitter because they felt they were not given the operational information that could have prevented the ugly occurrence. Investigations further revealed that the angry soldiers became unruly and refused to take further orders from their superiors. It was gathered that the soldiers, who came from 103 Battalion, Okuname under 81 Div Enugu, only take instructions from their commanding officer. It was learnt that the commanders are still in the process of resolving the issue as of the time of filing this story. However, the Director of Defence Information, Maj. Gen Chris Olukolade, said the officers only went to their commanders to narrate their operational experience. He said the issues had been resolved. He confirmed that the Special Forces bombed the main operational headquarters of the insurgents where many of them were killed in droves. Olukolade said, “There were operational issues; the issues have been resolved for the operation to commence. The spokesman added that some of the soldiers that were said to be missing had returned to base. This entry was posted in Breaking News, News, Politics and tagged Hundreds Of Boko Haram Terrorists Killed 20 Soldiers Missing In Borno, latest Nigerian news. ← DJ Jimmy Jatt and His Wifey Celebrate 18years Of Marriage!! !